My clients call me the home therapist! They say that after experiencing the effect of their freshly designed home on how they feel. Well- designed and distinctively furnished rooms have an effect not only on how occupants feel but also on how they function. As a founder and president of Gailani Designs, Inc., I am passionate about helping people feel happy, comfortable and productive in their homes. I take my clients’ style preferences, design ideas, and budgets into consideration and guide them in creating amazing spaces in which to live, work, relax, and entertain. The same effect happens in any environment, whether it is an office, hotel, retail space, or medical facility. When space is well designed, employees are comfortable and productive and customers and patients are relaxed and happy. With decades of education, training, experience, I provide high-quality and creative window treatments, furnishings, accessories, and lighting. Nonresidential clients – such as architects, builders, contractors, real estate agents, and interior designers – partner with me because such a relationship allows them to provide necessary, value-added services to their clients, which helps set them apart from competitors. My specialties include: •Custom draperies, ranging from simple and unadorned to luxurious and embellished •Motorized window coverings, such as cordless blinds and shades with remote controls •Home and office automation systems for convenience, safety, and energy efficiency •Color consultation •Custom furniture design and specification Everyone deserves to live, work and do business in comfortable surroundings. My goal is to work with clients to create beautiful and luxurious environments that are also comfortable and functional. My mission is to turn homes into fabulous retreats, work environments into happy places, and commercial and medical spaces into calm and comfortable settings. For free design consultation and estimate call (630) 420-0800 or cell (630)854-9082. 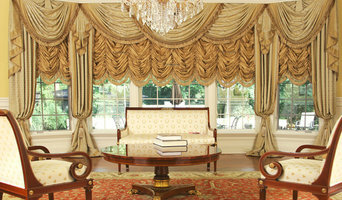 Designing and fabricating window treatments of luxury living. Covering a home legacy with quality and style. Custom Drapery Workroom is a full drapery service capable of drapery design, fabrication, and installation specializing in luxury window treatments. Customization is held in high regard in the workroom placing a priority to create drapes that reflect the style of the home and homeowner. The artisans strive to create beautiful curtains that give definition to any home decor. The workroom has been creating draperies of unmatched quality and style since 1999. The workroom is capable to design and create custom work including: drapery panels, cornices, roman shades, austrian shades, valances, sheers, curtains, decorative pillows, bedspreads, duvets, headboards, and bedskirts. Schedule a free in home consultation with our expert and renowned interior designers. We create award winning designs that are competitively priced in the industry. External designers have used our workroom to bring quality drapes to their clients. Chicago's Trusted Window Treatment Experts - 2x Best of Houzz Winner! Beyond Shades welcomes you to shop where you want when you want. Chose our Hunter Douglas gallery and showroom for homeowners and designers or call and schedule a shop-at-home appointment. Our Gallery is open seven days a week. Whether you're seeking new shades, blinds, shutters, draperies, wallpaper, area rugs, or upholstered headboards, we can help. We are happy to assist you with any size project. 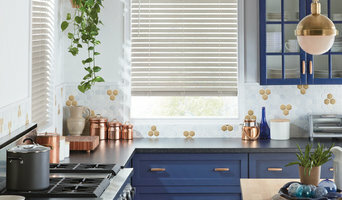 Beyond Shades is a authorized Hunter Douglas dealer. Our selection includes the Alustra collection which is only available through select retailers. We also offer a wide range of the premier fabric brands for custom window coverings, bedding, curtains, and drapes to meet your needs. We measure for a perfect fit and our certified Hunter Douglas installation team measures and installs your product. Our team works directly with you to come to the best solution for your home, business, or commercial needs. Whatever you imagine or whatever we imagine together can be yours. Ogden Blinds is a family owned and operated window treatment company offering the finest Hunter Douglas Window Fashions in Chicago and the suburbs since 1995. How can we do this? Since Ogden Blinds has no store overhead expense, we can pass the savings directly to our customers. The owner with 20 years of design, install and product knowledge will bring all the samples that are normally seen in stores directly to your home to insure a match to your home's decor. I do not have to call a contractor to measure or install. I use only myself, a Hunter Douglas Master Installer, and my employees with at least 15 years of experience for any Ogden Blind project. Our service includes expert product advice, professional installation, blind repairs and ultrasonic cleaning. If you want expert service from day 1 to year 20, Ogden Blinds is the right company for your window treatments. We also have the fastest delivery and installation times for most products, within 2 1/2-3 1/2 weeks. Installation is free of charge during normal business hours. *Hunter Douglas Authorized Dealer* Finishing Touches Solutions is locally owned servicing the the Chicago suburbs. We specialize in Window Treatments for your home. We Bring our mobile showroom to your home to guarantee the perfect solution. We are a Certified Consultant with Hunter Douglas and carry an extensive line of beautiful drapery fabric & hardware to create the perfect window treatments. Finishing Touches will provide expert consultation to help you select the perfect window treatments for your needs. We measure your windows and provide Hunter Douglas Certified Installation of your new window treatments. Your Hunter Douglas products are covered by a Limited Lifetime Warranty which is the best in the industry. As your local expert in custom window coverings, Budget Blinds can help you cross one more item off of your "to do" list with a FREE In-Home Consultation. We offer shop at home convenience, taking the hassle and guess work out of shopping for window coverings. With Budget Blinds, you'll have the opportunity to select from all the best brands in the industry, and our professional measuring and installation guarantees that your new window coverings will fit perfectly and your home with look amazing. Budget Blinds is a full service company, so you can count on us to take care of you from the selection and ordering process, expertly install your new pieces, and be here for you should you need any adjustments or repairs in the years that follow. Everything we offer is custom made to your window dimensions and your specifications, and each piece is one of a kind. Naperville's Trusted Interior Design Resource Since 1946! 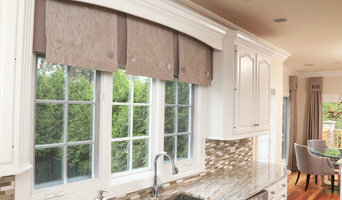 Skyline Window Coverings & Design is a boutique window treatments and design inspiration company. We combine our passion for helping our clients create the perfect atmosphere in their homes, while providing exceptional beauty and innovative lifestyle function. We pride ourselves on personal service and quality products. With years of experience in the design field, we offer advice and guidance for your home, helping you find the ideal blinds, shades and shutters. Selecting your custom window treatments should be an exciting experience, and we provide a free, in-home consultation so the fabrics and materials coordinate beautifully with the other design elements of your home. Your custom appointment also allows us to help you make the best decisions–based on your home's unique needs. We offer professional installation to ensure a high quality experience from beginning to end–and beyond. Motorization is one of our specialties. Experience the difference with Skyline Window Coverings & Design. Serving Downtown Chicago, Chicago's Western Suburbs and Portland, OR. Blinds & Designs by Nicolette Inc.
Revitalizing home interiors is something I’m passionate about. I love working closely with clients to change the look and feel of their home, ensuring that it perfectly suits their evolving style and needs. I have twenty years of experience in interior design and continue to be inspired by the creative challenges involved in the work. As an In-Home Designer for Smith & Noble, I’m able to use their wide array of custom window fashions to fine-tune the look of my clients’ spaces. When I’m not working with a client, I enjoy doing crafts and spending time with family. We’re JC Licht, and we’ve been giving expert advice and assistance to those looking to breathe new life into their Chicagoland homes since 1907. Our customers are also our neighbors and friends, and they trust us to share our expertise and provide them with superior products and outstanding service. We offer a wide range of products, ensuring you have the right products to make your work easier and your results professional. This includes the best paint in the business: Benjamin Moore. But it doesn’t stop there. We also have the latest in high-quality wallpaper and window treatments from brands like Hunter Douglas®, Graber® and Brewster® Home Fashions, as well as paint-related products and accessories to help you get the job done. When it comes to inspiration, you know it when you see it. So come on by one of our many Chicagoland locations. You bring us your inspiration, and we make it happen. We are a full service window coverings provider that specializes in new construction projects. We are family owned and provide a very individualized process from design all the way thru install. Our philosophy is to put ourselves in the shoes of the customer and deliver the best possible value based on their wants and needs. We started in 2005, and this philosophy has led us to being an almost exclusively referral based business. We’re your source for top quality custom window treatments. Sunburst offers plantation shutters, blinds, shades, draperies and window film to fit any decorating style and any budget. We pride ourselves on offering the best window coverings in the business. If you’re looking for outstanding quality backed by great warranties and the best customer service in town, you’ve come to the right place. Our design professionals will help you pick the perfect window coverings. Whether you’re looking for a certain style or color, maximum energy efficiency, cordless/child-safe window treatments, light or noise control, absolute privacy, environment-friendly fashions, extreme durability or more, Sunburst Shutters & Window Fashions has it. There really is a difference in window treatment companies… and Sunburst is the best. For over 30 years we’ve built a reputation for exceptional service and outstanding products. Give us a call and you’ll see the difference. We’ll help you accentuate the beauty of your home. With Sunburst Shutters & Window Fashions, you’ll give your windows the treatment they deserve™.